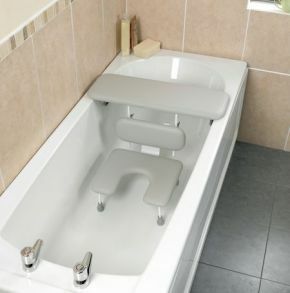 The Ascot is a top of the line combined bath board and seat, beautifully designed for the greatest possible comfort and safety both whilst in the tub and when getting in and out. The board, seat and backrest are padded for comfort and support and there is a cut-away portion at the front of the seat to make personal cleansing easier. Like all the best bath board and seat sets, the frame is adjustable so you can choose the perfect water depth. The feet are fitted with no-slip ferrules for greater security. It suits users up to 20 stone, and will make bathing safer and much more comfortable.